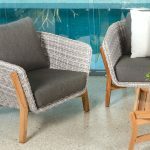 Crafted with handwoven wicker, the furniture range has been designed for outdoor living and is high UV resistant. 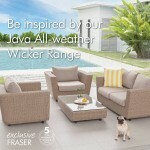 This wicker furniture is also easy to clean and care for and features a rust-free aluminium frame. 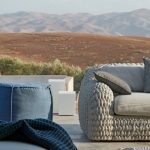 The Moto wicker modular also lets you mix and match pieces to create an outdoor furniture collection that perfectly suits the size and style of your outdoor entertaining space or living area. 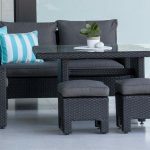 If you’re looking for a setting to enjoy with guests, the black wicker Emporium Casual Dining Setting combines sofa-style comfort with the practicality of an outdoor dining collection. 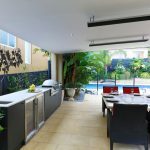 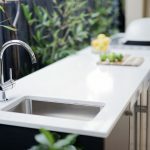 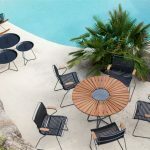 The versatility of the Emporium allows you to enjoy both outdoor dining and relaxation with the convenience of one setting. 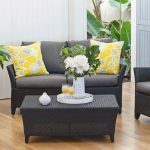 For elegance and style, the Sofia is a coffee table and armchair setting that looks great inside or out! 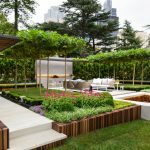 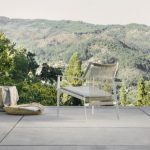 Olefin cushions, designed to be chemical, perspiration, mildew and weather resistant, make outdoor furniture settings particularly easy to care for and a low-maintenance indoor option.